With regards to the latter, naturally (! 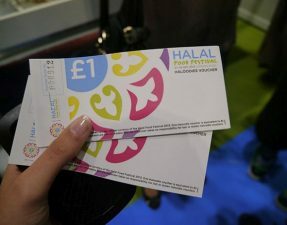 ), there are two main reasons for this: seeing as there are still 100s of halal restaurants for me to discover, visiting each one twice before I put up a review will cause a serious lag in the posts, and secondly, ££££££, these meals aren’t free! Luckily, for you guys, there was only one place that I was willing to visit twice before I put up my review, and that was Fatburger. 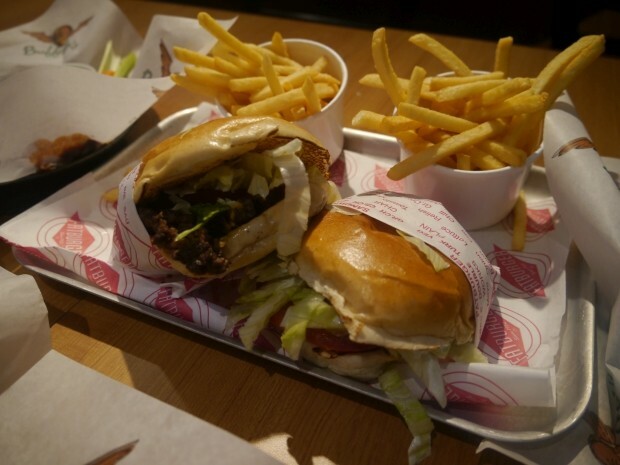 Before I start my review, I have to say it seems a lot of people have visited Fatburger expecting to find your typical halal gourmet burger restaurant. Just remember that Fatburger, at the end of the day, is a fastfood restaurant, so do not go there with expectations of elaborate signature burger concoctions or omg-rosemary-fries; Fatbuger does fast food and does it well. 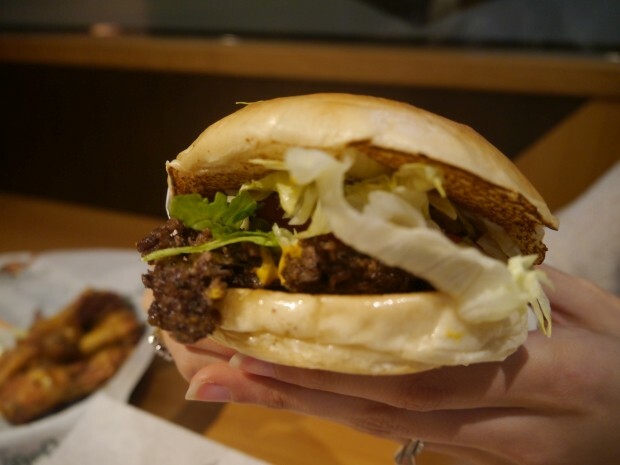 For those of you who attended the pre-launch organised by “The Best Halal Burger in the World” group, it was great to see so many familiar faces there! The turnout was good, and the crowd were generally friendly, making it a fun evening. Tasters were being dished up and passed out to all us anxious, hungry burger-lovers, and depending on how long you stuck around for, you were able to try almost everything on the menu. Although looking the part, the burger was a tiny bit dry, and needed that moisture from the green relish served on top. I’ll put this down to the burgers being served as halves, meaning they would become dry by the time they reached us. 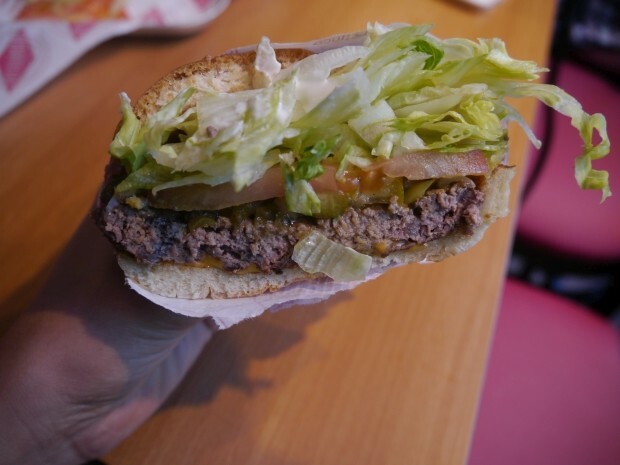 Also, I must say, the problem I’ve always found with Fatburger, both in Dubai and London, is that they put way too much shredded lettuce into the buns, making the patty have a very irrelevant part in the burger. They had used a juicy chicken breast for this burger, and simply grilled it. It was nice and not underseasoned, but perhaps could have done with a little kick. Would it be bad of me to say that I enjoyed this burger? 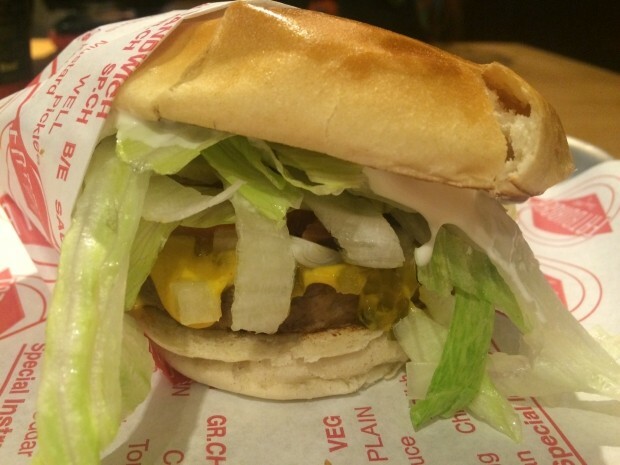 I know, the vegetarian option… shame on me, but the patty was juicy, and tasted very similar to the beef option. When paired with some of their hot sauce, this was a really, really good burger! The wings were fantastic. Not only were they fresh and hot from the fryer, they were so incredibly juicy that I couldn’t stop at just one. Over the course of the evening, I tried both the lemon pepper boneless wings, which had a great peppery crust with a subtle zing from the lemon coming in afterwards, and the hot wings, that were deliciously spicy but not too overwhelming. 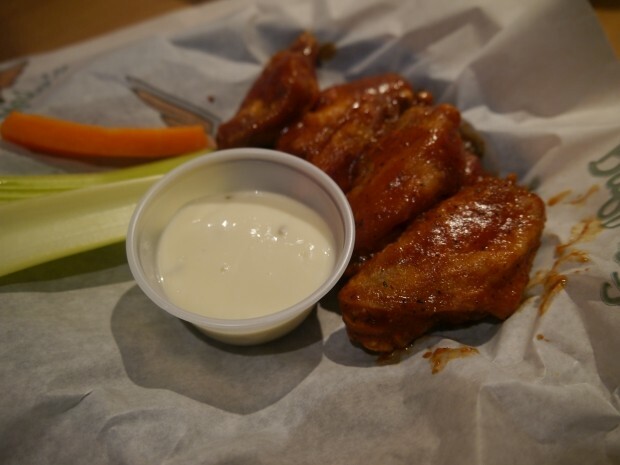 Their accompanying blue sauce was a bit weak, but was still a good and cooling option for dunking the wings into. One of the waiters magically dropped these guys on to our table. 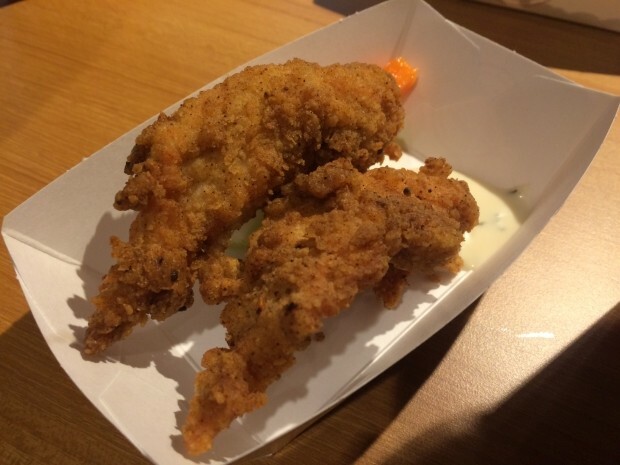 Deep-fried chicken tenders that had a mouth-watering crunchy skin, and succulent chicken meat on the inside. Make sure you opt for a pot of hot sauce on the side to dip the chicken into. Considering this was their first pre-launch before the actual opening, I would say that the staff did a good job in keeping up with the demands of the crowd. Of course, a little shaky, but with a week until the official opening, they still had plenty of time to perfect themselves. 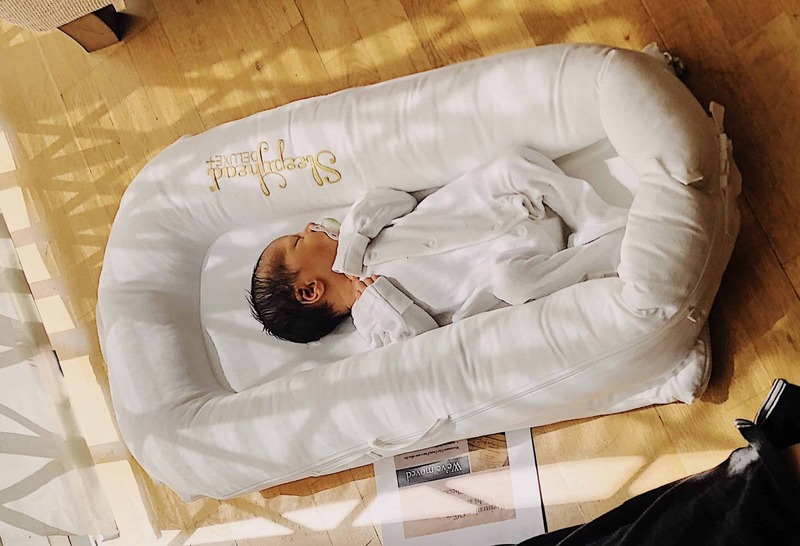 Following my first visit, BW and I were then invited to the friends and family pre-launch event on Wednesday. By the time we arrived, the queue at the till was insanely big, and unfortunately, we were all the way at the back. Slowly but surely, the long line died down and it was our turn to order, however, at this point they were only serving single burgers! 🙁 Anyways, we managed to place our order and took a seat, awaiting our yummy goodies. The burger arrived fresh and piping hot to the table, and was stuffed with the usual trimmings: an abundance of lettuce, green relish, tomato, onion, and melted cheeeese. The bun was, as expected, soft and squidgy, and held the burger together really well. Now, before we get to the patty, I will remind you guys again that Fatburger is a fast food restaurant, so do not expect a chunky, medium cooked, gourmet burger. The meat had been simply seasoned with salt and pepper, and then smooshed on the cooker, allowing the burger to have a nice smoky crust. It was definitely a juicy little guy, and the flavours were brought out more with the accompanying relish and burger trimmings. However, as I mentioned in my first visit, perhaps the burgers could do without such a big pile of lettuce so that the patty itself does not get overshadowed. Needless to say, I did enjoy my burger to the very last cheesy bite! For those of you watching the waistline, Fatburger offer an option of a skinny burger where lettuce is used instead of bread. 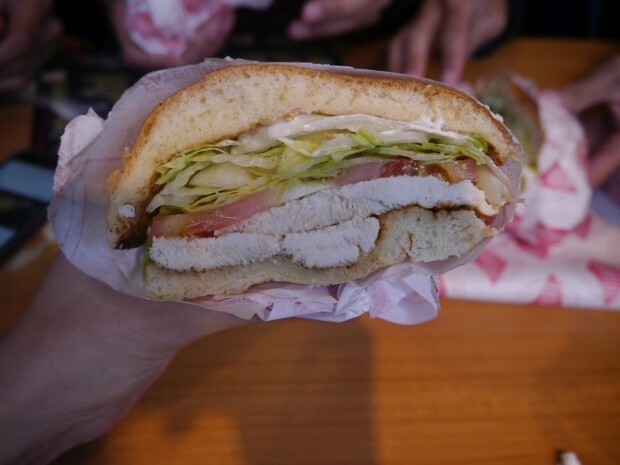 If that is not enough for you, they also offer a grilled chicken, or turkey burger – both using lean meats. The fries were nothing out of the ordinary but were simply nice and crunchy. 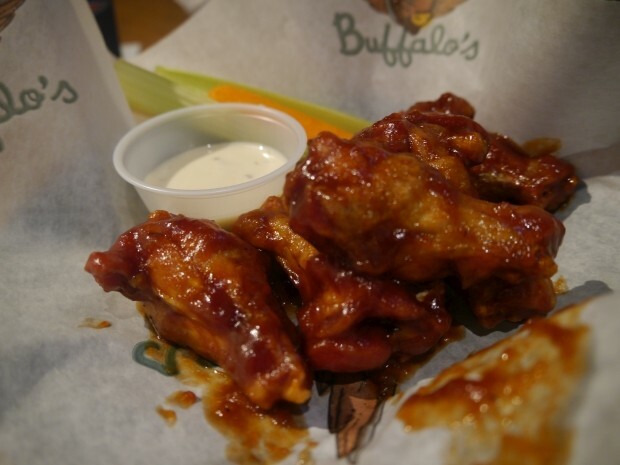 Oh boy, the wings. 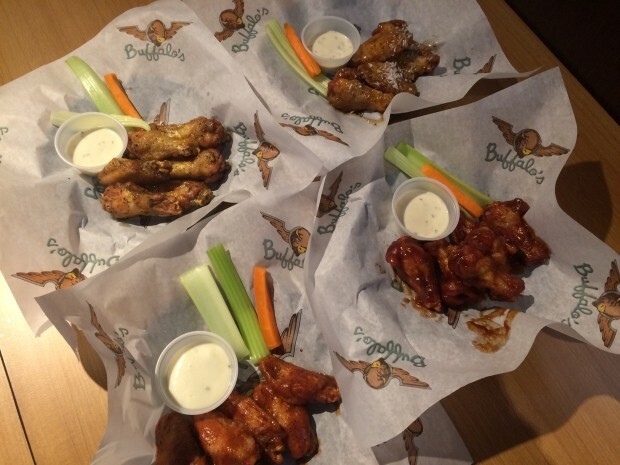 Luckily, we were able to order a selection of wings as we were one of the last orders and I’m so glad we did. 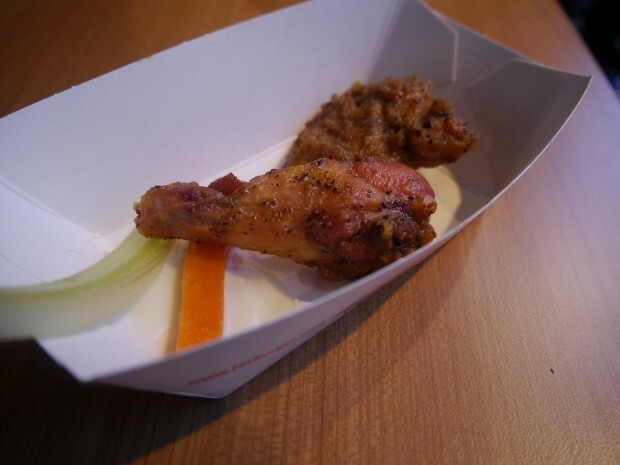 Fatburger has joined forces with Buffalo’s to add a wide variety of wings and other chicken options on to the menu, and if you see from the photo below, have a scale in terms of the level of hotness. coconut jerk, and the carolina fire bbq. 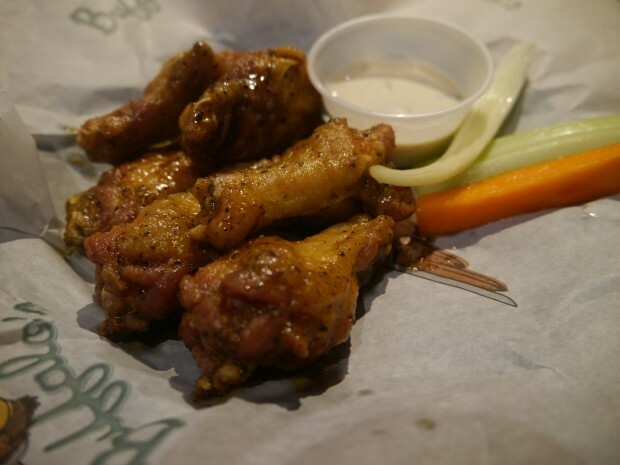 The lemon pepper wings were by far my favourite as I’m sure most of you will agree. Juicy wings with a black peppery marinade to give a little spicy kick, followed by the tang from the lemon – they were incredibly moreish. The coconut jerk was a combination I had not tried before but definitely appreciated it. 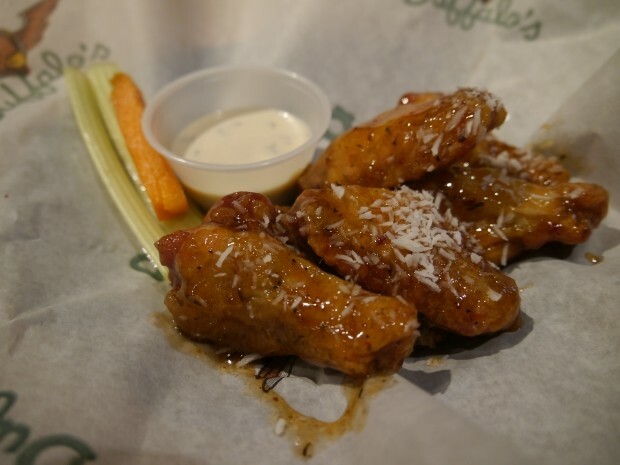 The wings had been marinated in a sticky and spicy jerk sauce, and then topped with dessicated coconut which balanced out the sweetness of the jerk. They also had a strong rosemary aftertaste which deemed them to be the marmite of the lot! As for both the bbq wings, well, these aren’t usually what we go for but the sauce was actually really well balanced, and not too sweet. I noticed BW making sure to eat every last one of these! I was sadly unable to order a milkshake BUT I had a little taster of the vanilla milkshake [£4.00] and it was deliciously creamy. 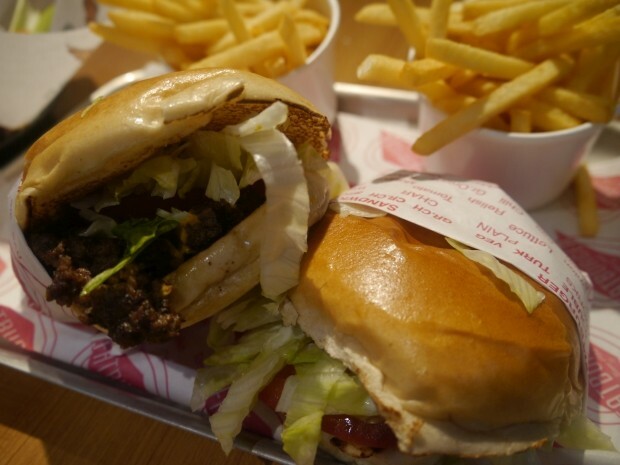 The prices are shockingly extortionate with a single fatburger meal costing up to £10 but you have to remember that Fatburger is an example of well established fastfood that carries a brand premium such as other international chains like Five Guys and Shakeshack. Secondly, their burger are not processed and use fresh, lean meat. 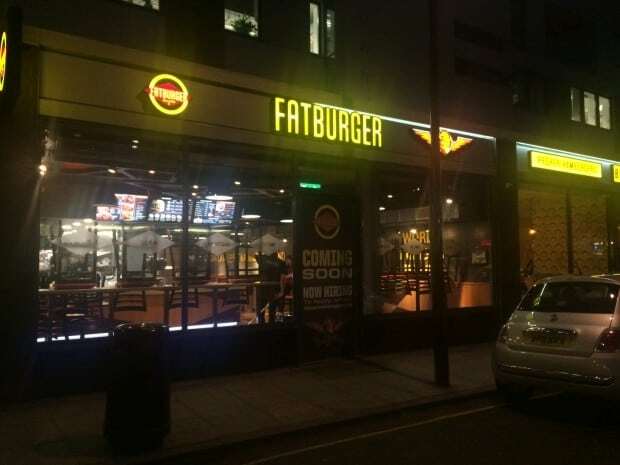 Of course, the restaurant may be a little small, the queues may be a little long, and the prices may be a little high, but the team behind Fatburger London have worked hard to bring us a halal version of one of the most famous burger chains in the US. 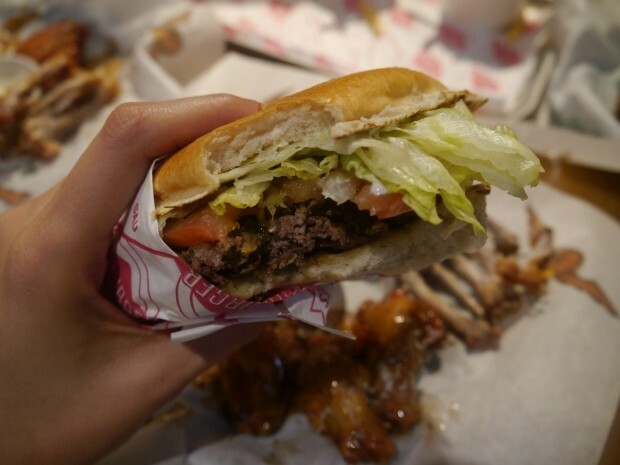 Not only are the burgers good, but the addition of the wings and tenders make Fatburger that much better. In order to get a good Fatburger experience, I suggest either ordering a double mushroom Fatburger, a single with bacon and a fried egg (the egg is a must! ), or trying your luck at the huge triple (unbelievable burger coma!). Halal status has been verified by the Muslim owners and certificates are available. They do not serve HMC. Don’t think Fatburger is a fast food place, although food arrived fairly quick in both my visits as all burgers are made to order. And the patties, from what I can tell looked home made as they were pressed into to the griller rather than factory prepared patties. 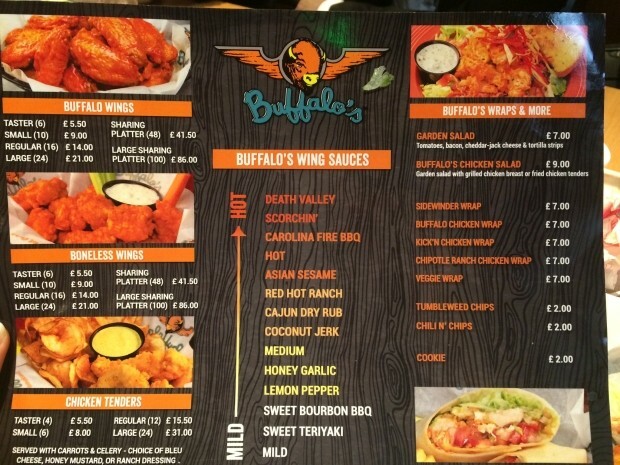 Anyway, burgers and wings are amazing there, although a tad over priced. The one in Dubai didn’t leave much of an impression on me, this one did! If they halaal…why does your last sentence recommend “a single with bacon “? Halal bacon, made with turkey meat. Yes, they have halal certificates and it is Muslim owned too lol. Good reading, and what a way to waste a work day afternoon :-D! Having lived on both sides of the non-halal/halal food spectrum, it’s fascinating to see the foods that I grew up with Stateside popping up in little establishments all over London with premium price tags. 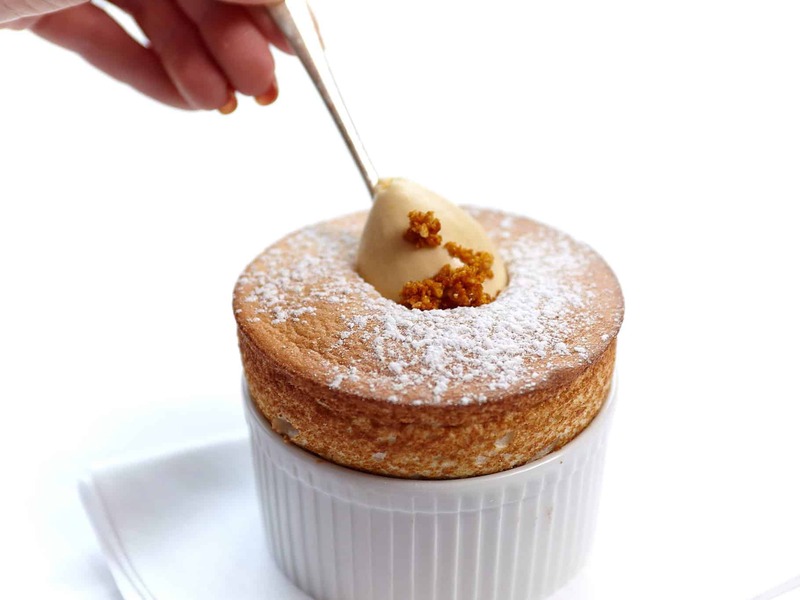 Who knew the ‘soul food’ from my childhood would be sought out by London hipsters!? 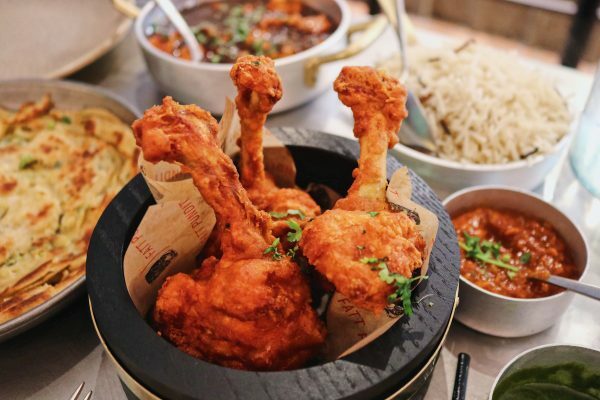 And what’s with the American chains gone halal (in London anyway) – PF Chang’s? Fatburger? Good that you spotted that the latter is not a gourmet burger establishment! By no means glam, for me, Fatburger is decidedly LA (I didn’t know they existed outside the Greater Los Angeles area ’til now); besides the numerous falafel and shawarma joints, for at least a good 30 years or so their turkey burgers have been a staple of the Westwood scene – a kind of upscale shopping and entertainment village just outside of the UCLA campus. I remember somewhere in the late 80s the first time I had a turkey burger there, slightly dry but flavourful and something of a novelty in a country where beef was, and continues to be, king in the burger market. Incidentally, I don’t think any of us went to Fatburger for a beef burger. For that, the best place was In-N-Out, whose format I suspect places like Five Guys are now copying. Pardon the phrase, but in my opinion anyway, In-N-Out is the holy grail of the ultimate (halal) burger. 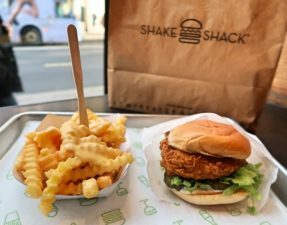 They have quite the following of non-halal foodies and for many, are considered THE BEST and most authentic tasting of a good old fashioned American burger. Sadly, it’s a family owned business and they refuse to go into franchising. Being a discretely Christian business (they put bible verse numbers on inconspicuous places on their food packaging) , I’ve tried to justify eating a burger here but can’t seem to convince myself that simply saying Bismillah will do the trick. Shame too, as there’s not a shred of bacon on their menu, last I checked. Also, about authentic Mexican food. 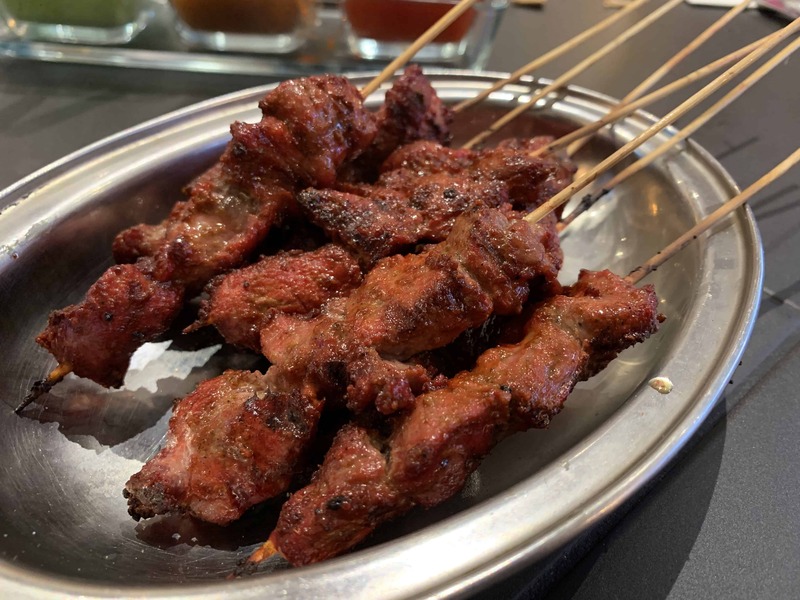 I heard Mestizo near Warren Street station is authentic but it’s not halal. In the brief period that I I tried some of the trendy ‘Mexican’ eateries out here, I found them simply awful. No real corn tortillas, flavourless meat, etc. It’s pretty dire. Can I offer some suggestions? If you can find any Latino Muslims in the restaurant business, that might be your best bet. 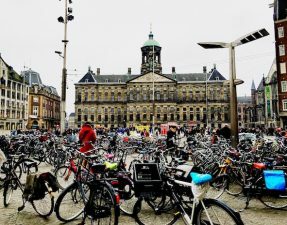 Assuming you’ve not had the real thing already somewhere in your travels, doing so will afford you the opportunity to sample the wonder that is menudo, or try home-made tamales and find out what real tacos and burritos should taste like. Maybe someone out there has already thought of a way to make halal versions of ‘tripas’, ‘al pastor’ or ‘carnitas’. 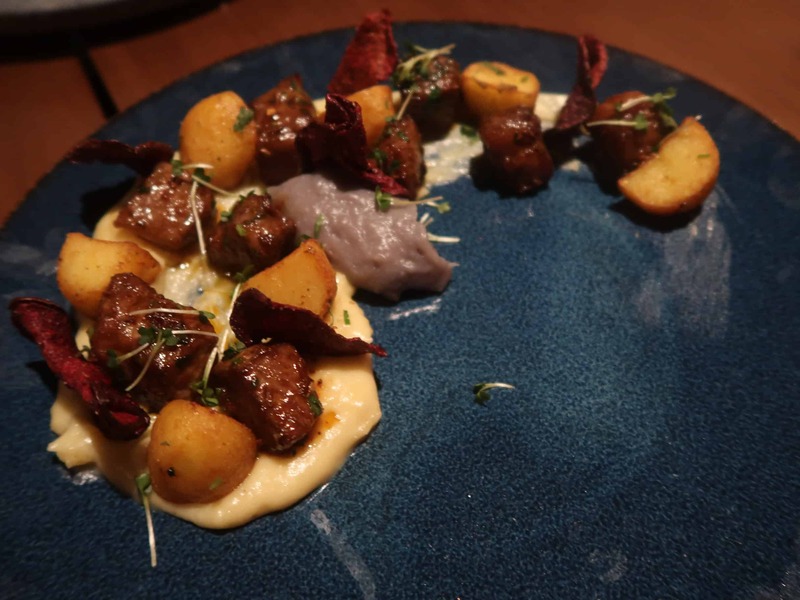 If you’re brave enough to try them, done right, lengua tacos are out of this world. These are just my personal faves, but there’s so much more to Mexican than just street food. Not a personal fave, but mole is an interesting way to use cocoa(and not how you’d expect chocolate to taste, I might add).